Joe Townsend scored for Moulton Harrox against Stamford Lions. Stamford Lions lost a Peterborough Premier Division match for the first time since October 1 yesterday (April 15). Joe Townsend’s strike was enough to give promotion-chasing Moulton Harrox victory at Broad Lane against a team who finished the match with nine men. Carl Bird (right) scored twice for Peterborough Sports Reserves at Sawtry. Ollie Maltby’s goal was enough to give fourth-placed Pinchbeck a 1-0 win at Langtoft, while Carl Bird scored twice as leaders Peterborough Sports Reserves won 5-0 at Sawtry. Jack Barron, Ian Bradbury and Karl Gibbs also scored for Sports who face a tricky fixture at Netherton United on Wednesday (April 19). Moulton and Pinchbeck have home games on Tuesday (April 18) against Thorney and Crowland respectively. Netherton have shot up to third on the back of six straight wins, the latest of which arrived yesterday when Crowland were despatched 3-1 at the Grange. Jon Kerrison, Adam Scott and skipper Herbie Panting scored for the city side. Crowland are back on the bottom after their defeat as Uppingham leap-frogged them with a come-from behind 2-1 win at Leverington. 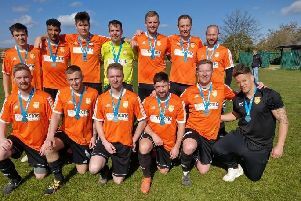 Josh Staggs scored twice in AFC Stanground Sports’ 4-3 win over Stilton United, while ICA Sports rebounded from their unfortunate Hunts County Cup Final defeat to win 1-0 at Thorney. Conor Pridmore scored the goal. A James Betts penalty gave Ketton a half-time lead at Wisbech Town Reserves, but second-half goals from Andre Da Silva, Adan-Jay Lewis and Oliver Williams delivered victory for the Fenmen. Joe Morley replied late on for Ketton. Sawtry 0, Peterborough Sports Reserves 5 (Bird 2, Barron, Bradbury, K. Gibbs). Thorney 0, ICA Sports 1 (Pridmore). Wisbech Res 3 (Da Silva, Lewis, Williams), Ketton 2 (Betts, Morley). Moulton Harrox v Thorney, Pinchbeck United v Crowland Town, Holbeach United Res v Stamford Lions. Ketton v Sawtry, Langtoft United v Deeping Rangers Res, Netherton United v Peterborough Sports Res. PFA Junior Cup final: FC Peterborough v Bretton North End (7.30pm, In2itive Park, Yaxley).